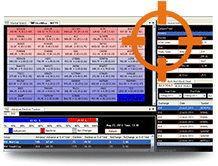 Now spot real time trading opportunity conveniently by customising your preferred technical parameters. Live Scanner is tool which tracks New Highs and New Lows for Stocks with Price Movement. Snap View gives a complete picture for any scrip with following information. 12. Medium and Large Cap Stocks with high dividend yield but low P/E ratios. Bulk deals refers to transactions where the total quantity traded in a stock ( whether bought or sold) is more than 0.5% of the number of equity shares of the company listed on the stock exchange. The quantity bought or sold could be through single trade or multiple trades. Block deals is a trade with a minimum quantity of 500,000 shares or minimum value of Rs. 5 crores, executed through a single transaction on a special "Block Deal Window" The window is opened for 35 minutes in the morning trading hours. SEBI rule states that block deal orders should be placed for a price not exceeding +1 percent to -1 percent of the previous day's closing or the current market price. Advance Decline ratio is market-breadth indicator used in technical analysis to compare the number of stocks that are trading positive with the number of stocks that are trading negative with respect to their previous day's closing prices. This widget shows the Advance-Decline Ratio for all NSE & BSE Indices. It shows a color coded bar in which Blue depicts Advances, Red depicts Declines and Grey Depicts No change. Heat Map is a Tabular representation of stocks for a Group/Index in ascending order of their price movement with respect to yesterday's closing price. The table is color coded where the negative stocks are displayed in Red background and positive stocks are displayed in Blue Background. You can also load your user-defined Market Watch in Heat Map. Moving Averages means the average price of a security over a specified time period. The most commonly used are 3, 5, 13, 20, 50, 100, 200 days. Moving Averages are used in order to spot pricing trends by flattering on large fluctuations. This is perhaps the most commonly used variable in technical analysis. Its data is also used to create charts that show whether a stock's price is trending up or down. It keeps your informed about Major American, European and Asian Market Indices. Gross delivery of shares is the ratio of deliverable quantity of shares to the total quantity of shares traded in the exchange on that trading day. 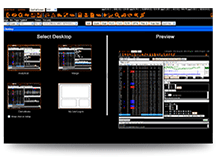 Enhance your trading experience with shortcuts & customised screens. 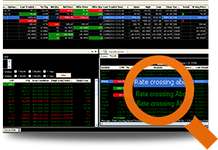 Use multiple functions for your desired stock using Symbol Bar. You can arrange multiple widgets in grids as per your convenience. You can also auto hide them anywhere in Trade Racer Desktop. Select among 3 themes and customizable layout for your desktop. Select your own colors and font.